Would you like to see this in the game some day? Rheinmetall unveiled details of its proposal for the Challenger 2 Life Extension Program (LEP). 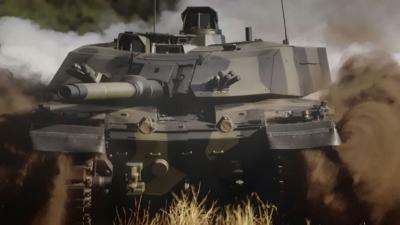 The company’s solution has been to develop a completely new turret for the Challenger 2, which has a fully digital electronic architecture, new day and night sights for the commander and gunner, and a Rheinmetall L55 smoothbore 120 mm gun. The L55 gun is capable of firing Rheinmetall’s 120 mm ammunition family, and the typical loadout would include the DM63 armour piercing fin-stabilized discarding sabot (APFSDS) for armoured targets, and a DM11 programmable high-explosive round with impact, delay, and air-burst settings. The commander is provided with a panoramic sight. Although the Rheinmetall proposal does not feature an active protection system (APS), the new turret is capable of mounting such a system according to user requirements. He added that the turret also contains under-armor links, as well as having increased power and weight capacity, which would enable a customer to fit the vehicle with an electronic warfare system. It is likely that when mounted on the Challenger 2, such a system would be intended to disrupt the remote detonation signals of improvised explosive devices.